« Catastrophic and Reckless: How Bush brought America to the brink of economic ruin! Bush’s new PR offensive is a recycled old lie and thinly disguised McCarthyism. Bush will try to convince the American people that Iraq is a part of the war on terror and, opposing the war is un-American. 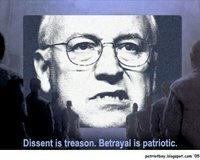 Never mind that Bush’s war on terror is not only phony, it makes real terrorism worse and endangers American lives. What will happen when we get a real terrorist threat? Merely asking makes you a “Nazi appeaser”. Bush and Rumsfeld breathe new life in odious McCarthyism. This cynical exploitation of fear does not makes us safer. It endangers us all. Secondly, even Bush admitted �after having lied it about it for years �that Saddam had nothing to do with 911. So which is it? It’s unclear how Bush intends to convince people that Iraq now has anything to do with terrorism when only a few days ago he told the truth at last by denying it. So �when Bush now says that Iraq is a part of the war on terrorism, Americans should ask themselves: was Bush lying then or is he lying now? Clearly �the oft called “insurgents” had nothing to insurge against before the US invasion. Is this what Bush hopes you will believe are terrorists? If so, then Bush’s failed US policy has caused it. It will simply dissipate when Bush admits that he has committed capital crimes and removes US troops from the war of aggression that he ordered in violation of Geneva, the UN resolution, Nuremberg Principles and US Codes, Title 18 � 2441. War crimes. Read Title 18. It’s a capital crime. And Bush has already lied about his new “PR offensive”. He claims that it is not politically motivated. But surely it is a response to the fact that the latest British terror alert did nothing to restore American confidence in Bush’s utterly failed administration. Americans seem immune now to color codes, MSM hyperbole about improbable “binary bombs”, and empty rhetoric about terrorism. Bush now finds it impossible to tell the truth without confessing to a multitude of previous falsehoods. None of his various pretexts for war were true; all of them have been proven false during a long and miserably failed American occupation of a country that had nothing to do with 911, a sovereign nation that never attacked, never posed a threat to the people of the United States in any way. MSNBC’s Keith Olbermann, meanwhile, is among a growing chorus that sees the “war on terrorism” for what it is: a boogeyman exploited by a cynical, extremist administration that now dares to slap the label “Nazi appeaser” on legitimate dissent and criticism. During a large-scale protest in downtown Salt Lake City on Wednesday, Mayor Rocky Anderson unleashed perhaps his harshest criticisms yet of President George W. Bush — just hours before the president was scheduled to arrive in Utah. “Iraq had nothing to do with the terrorist attacks on the United States… and there was no weapons of mass destruction in Iraq,” Anderson said from the steps of the Salt Lake City & County building. Another analysis blames weak US approach to Iran on poor intelligence. Two new reports criticize the US’s handling of Iran, just as the West gauges Iran’s response to a proposal meant to rein in Tehran’s nuclear ambitions. One report says the US war on terror has strengthened Tehran, the other slams America’s poor intelligence on Iran. The United States, with Coalition support, has eliminated two of Iran’s regional rival governments � the Taliban in Afghanistan in November 2001 and Saddam Hussein’s regime in Iraq in April 2003 � but has failed to replace either with coherent and stable political structures. The outbreak of conflict on two fronts in June �July 2006 between Israel and the Palestinians in Gaza, and Israel and Hizbullah in Lebanon has added to the regional dimensions of this instability. Consequently, Iran has moved to fill the regional void with an apparent ease that has disturbed both regional players and the United States and its European allies. Iran is one of the most significant and powerful states in the region and its influence spreads well beyond its critical location at the nexus of the Middle East, Turkey, the Caucasus, Central Asia and South Asia. This entry was posted on August 31, 2006 at 1:07 am and is filed under Model. You can follow any responses to this entry through the RSS 2.0 feed. You can leave a response, or trackback from your own site.